Private View: Sunday 10th June 2018, 11am – 4pm. The Exhibition continues until Saturday 30th June, 5pm. Bridget has always shown a fascination with a limited subject matter that engages her attention and provides her creative drive. This exhibition shows how rich that compulsion is and the diversity that can be achieved by playing with certain themes. Her very personal and attractive colour sense gives a rich unity to her work and at the same time her playful notes of individual colour add energy to the compositional whole. It is her playful use of shapes and her ability to lock them into an engaging unity that give such personality to her work. This is particularly noticeable in her delightful rendering of groups of sheep. These groups are simply created but each have a personality that fit so well into the interlocking forms of the landscape. This in in turn allows her to play with carefully selected juxtaposed rhyming colours. The flower paintings have a delicate colour sparkle and jostling freshness to them, that I am sure would lighten ones mood daily. And those hunters with their coloured socks, where are they walking to and what are the saying to each other? And the large paintings of young ladies who walk in an ageless landscape how lucky they are! Bridget has an apparent compositional innocence about all her paintings that belies an astute understanding of the flat plane, so essential to a modern work. This and her handling of flat colour give all her paintings an enviable unity. 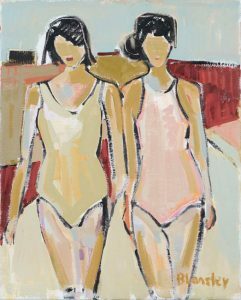 Above all her work has great individuality of style and a real sense of joy that is so enviable in a painter. I am so very happy to recommend this, Bridget’s delightful exhibition, to all that have the good fortune to see it.